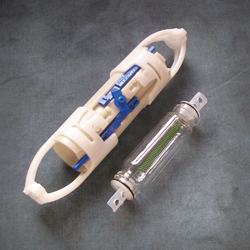 The Snap Sampler system uses a double-ended bottle design with snap sealing caps that captures a sample under in-situ conditions using a simple mechanical or pneumatic trigger at the surface. The integrity of the sample is maintained through analysis at the laboratory without exposure to air or potential contaminants. Samples are representative of groundwater chemistry using a simple passive sampling technique, eliminating well purging labor and purge water management.